The start of a new year holds the promise of a fresh start and the hope for great things to come. This year, don’t just sit back and wait for your dreams to come true. All it takes is a little drive, and the perfect place to find it is behind the wheel of your dream car. This year, it’s easier than ever to “own your drive” with the all-new 2017 GMC Sierra Denali 2500HD. The 2017 GMC Sierra Denali 2500HD has been redesigned from the ground up to complement the updated powertrain lineup. Befitting its high-performance pedigree, nearly two-thirds of the all-new Sierra’s cab structure is composed of high-grade steel. It’s the attention to detail that helps the Sierra Denali 2500HD stand out even further, including a bold Denali chrome grille, massive 20-inch wheels, and (on Duramax®-equipped models) an elegantly functional hood scoop that cools airflow from the engine and boosts horsepower. GMC has upped the ante for diesel performance with the latest generation of its Duramax® powertrain, which debuts here as an available option. The all-new 6.6-liter diesel cranks out 445 horsepower and 910 lb-ft of torque, an increase of 12% and 19% respectively over the previous model. The standard engine is an E85-capable Vortec® 6.0L with Variable Valve Timing (VVT). Paired with a heavy-duty 6-speed electronically controlled automatic transmission, this setup ably carries on the Sierra Denali’s heritage as a capable and effective everyday workhorse. 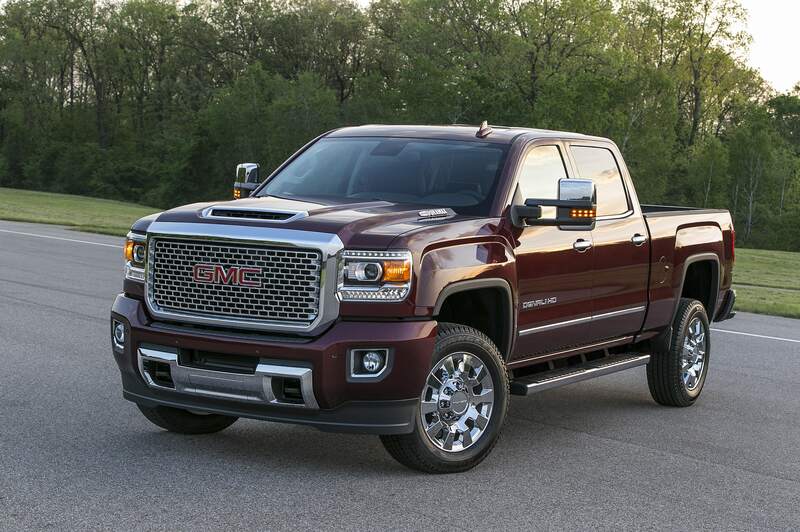 In addition to being tougher, the redesigned GMC Sierra Denali 2500HD is smarter as well. The new model comes standard with a GMC IntelliLink 8” color-touch radio with turn-by-turn navigation and access to real-time maps and weather. Pairing your smartphone is simple with compatibility for both Apple CarPlay™ and Android Auto™, and the Bose® Premium Speaker System makes every note sound crystal clear. This year, find a new beginning and the passion to chase your dreams at Rivertown Buick GMC. Contact us today to learn more about the 2017 GMC Sierra Denali 2500HD.